Not too big and not too long, the Tsomo is a child-friendly kayak that they will enjoy paddling. 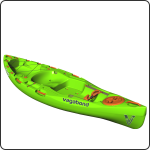 Its width gives this kayak superb stability, while the Paddle Cutaways allow it to feel narrower and smaller than it is and make it comfortable to paddle for small arms. The rear Tankwell is spacious and has enough space for a medium-to-large dog to climb on board. If the dog prefers to sit, rather than to lie down, line the Tankwell with a foam mat to prevent their paws from slipping. A playful kayak, the Tsomo has both forward speed and the ability to turn on a dime. 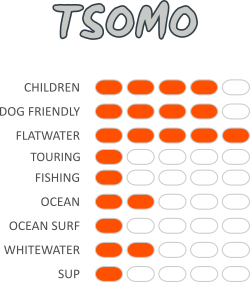 The Tsomo is not a touring kayak; you’d be better off with a Kasai, Marimba or Tarka. If you’re keen on kayak fishing, take a look at the Tsomo Angler version of this kayak, which comes fitted with Rod Holders, Deck Rails and an Anchor Trolley. The Tsomo can cut through breakers and ride the swell but if you’re keen on spending a lot of time paddling on the sea, then the longer Kasai will be more suitable. Your Tsomo will get you in and out of the breakers, but if you would like to get into doing pan-ams, floaters and airs, our Dumbi kayak is the one to take to the beach. You can take the Tsomo down rivers and enjoy tripping sections with small rapids. Use the 8″ Screw Hatches and Tankwell to secure gear for full-day and overnight trips. While we don’t recommend paddling the Tsomo from a standing position, use the Stand-up Platform to stand, stretch your legs and enjoy a height-above-water view to check out your surroundings, while you’re out on the water.